Metalloproteinases of the astacin family such as tolloid play major roles in animal morphogenesis. 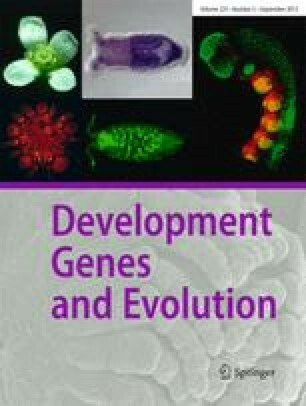 Cnidarians are thought to be evolutionary simple organisms and, therefore, a metalloproteinase from the marine hydrozoan Podocoryne carnea was analysed to evaluate the role of this conserved gene familiy at the base of animal evolution. Surprisingly, the proteinase domain of Podocornyne PMP1 is more similar to human meprin than to HMP1 from another hydrozoan, the freshwater polyp Hydra vulgaris. However, PMP1 and HMP1 both contain a small C-terminal domain with six cysteines that distinguishes them from other astacin-like molecules. Similar domains have been described only recently from sea anemone toxins specific for potassium channels. This toxin homology (Tox1) domain is clearly distinct from epidermal growth factor (EGF)-like domains or other cysteine-rich modules and terminates with the characteristic pattern CXXXCXXC with three out of six cysteines in the last eight residues of the protein. PMP1 is transiently expressed at various sites of morphogenetic activity during medusa bud development. In the adult medusa, however, expression is concentrated to the manubrium, the feeding organ, where the PMP1 gene is highly induced upon feeding. These disparate expression patterns suggest a dual role of PMP1 comparable to tolloid in development and, like astacin in the crayfish, also for food digestion. The Tox1 domain of PMP1 could serve as a toxin to keep the pray paralysed after ingestion, but as a sequence module such Tox1 domains with six cysteines are neither restricted to cnidarians nor to toxins.